When the calm flowing waters of the Zambezi River encounter the 1700-meter (1-mile) wide edge of the Victoria Falls gorge on the Zambia-Zimbabwe border, they abruptly plunge 100 meters (330 feet) to the bottom. The impact generates soaring mists and thunderous sounds that I could see and hear from great distances. This is the rainy season. The rising mist can become so thick that you see little. And the excessive moisture could damage your camera. Because this is the end of the dry season, the falling water can slow to a trickle along most of the the rim. The falls are strong and the visibility-obscuring mist is gone. For the best rim-level view, visit the Zimbabwe side of Victoria Falls. For the best base-level view, walk down the rain-forest footpath on the Zambia side. For the best overall view, book passage on one of the Zambian or Zimbabwean flight-seeing tours - only then will you appreciate the size of this wonder. 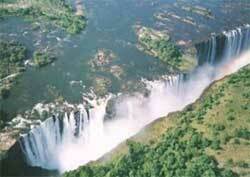 Globetrotters forever debate which is mightier, Victoria Falls or Iguazu Falls in South America. It's virtually a toss up, with a slight edge going to Iguazu Falls. Either way, both are considerably grander than the much smaller Niagara Falls. Besides viewing the falls from the rims, you walk down to the bases. You can also take a boat tour below the falls or a helicopter sightseeing trip above them. The sounds and rising mist of Victoria Falls inspired this wonder's native and official name, Mose oa Tunya, meaning "smoke that thunders".